OVERVIEW: The Beast of Terror is gnawing at the bones of our children. It has a new disguise--debt. It attacks our children in college, stuffing their pockets with credit cards and encouraging the youth to become slaves to debt. Learn how to fight the Beast of Debt Terrorto show the youth how they can live as Masters not Slaves to their financial future. GROUND ZERO PLUS 1071 DAYS--New York, NY, Monday, August 16, 2004--There’s a new kind of Terrorist stalking the children. It’s the Beast of Credit Card Terror. Physical Terrorism is only one approach to weaken the resolve of a nation. Another is to wreck its financial foundations. Lower Manhattan has legions of armed guards protecting Wall Street and other financial headquarters near the World Trade Center. But only a few are protecting the 15.6 million vulnerable children who attend America’s 4,182 colleges and get hooked on credit. If credit cards were treated like drugs and alcohol, perhaps America wouldn’t be enslaved in the quagmire of personal debt in which it currently exists. According to an article in the Christian Science Monitor, the average credit-card debt of US households soared to $9,205 in 2003 from a low of $2,966 in 1990. This debt reinforces the sad state of U.S. personal savings--just under two percent versus around eight percent from post World War II until 1980. But the frightening threat of American debt is the cancerous injection of its malignancy into the young, especially college students. American Demographics magazine reports that 1 out of 7 Americans by the age of 21 have more than $7,000 in credit card balances. One college is fighting the Beast of Credit Terror. The University of Minnesota banned credit-card vendors on campus after a health study linked credit-card debt to depression, drinking, smoking and declining grades. The University of Minnesota is a leader in the Sentinels of Debt Vigilance battle. But, is it the college’s job to parent the children about the Beast of Credit Terror. That’s the big question. And, there is a solution. Good or bad credit habits are passed down like manners. With 190 million credit cards hungrily sitting in people’s pockets and purses, there’s a lot of “bad credit habits” being passed on to the children by default. Only about 38 percent of cardholders pay their balances each month. In many cases, paying the minimum, depending on the interest rate, can make the balance last for up to decades. America and other nations that spend now and pay later may not realize the threat to a child’s security by growing up with a financial noose around his or her neck. 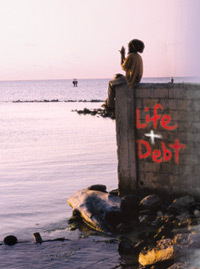 Debt becomes the Master and the debtor the Slave. Not teaching a child to be as wary of debt as he or she might be a potential suicide bomber is a form of parental negligence. Fear of being a slave to debt haunts people to a state of complacency where they resign themselves to be “forever owned” by others. About thirty percent of the population believes they will never be out of debt—an unjustified surrender to the Fangs of the Beast of Debt Terror. Is there a solution? A Parent of Vigilance has many roles. 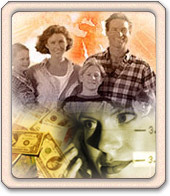 One of them is to teach the child “Not to be like me…” This attitude requires a “Parent Of Debt-Free Vigilance” to not accept his or her own bad habits in the financial arena as a genetic disorder, but rather as a lesson to be reversed regarding one’s children. Admitting errors is the first step in resolving debt. A Vigilant Parent teaches the child "Not to be like me..."
A family that is burdened by debt can take a positive attitude about working together to remove the debt—and make it a team effort with a common goal that benefits all. 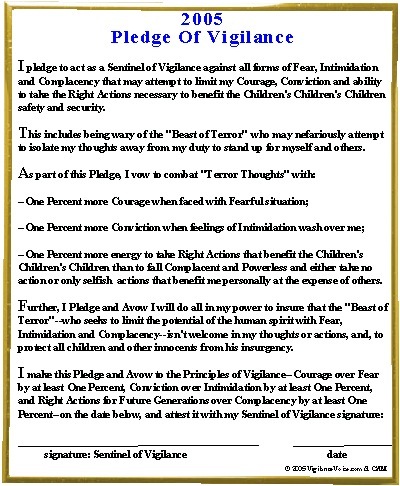 If a Parent of Vigilance sees the future safety of the child including being free from the Beast of Debt, the impetus to change will occur. The Family of Vigilance can make a vow to work on resolving the debt. Family budgets can be installed. Parents and children can work together on reducing the pressure to “buy now and pay later” by saving for things and paying for them in cash, where ever possible. It is the Vigilance of Prosperity for the child that can break the legacy of debt passed on by previous generations. When children see that parents are “working” on reducing debt and that the goal is to enrich the family, they realize that where sacrifices are concerned those sacrifices are for a goal larger than themselves. It is for the “family security,” not for selfish reasons. Often parents feel “guilt” or “shame” that they cannot afford what others have or cannot give their children what other children have, and drive themselves into debt in an endless race to “keep up” with the Joneses. By making “debt reduction” and “family financial freedom” the goal, and holding up rewards that the family can benefit from as a result—vacations, college funds, etc—then everyone is working toward a common end. Sacrifice now becomes an investment with powerful dividends. But nothing can be changed without a commitment. You can start by taking the Pledge of Debt Free Vigilance. Showing your children how to reduce one extra dollar of debt sends a big signal--that nothing is so bad it can’t be made better if everyone works toward the same goal. We, the family of ____________________________hereby vow to work together to reduce our debt and to become a Debt-Free Family. We vow to do our best to reduce our Debt by at least One Percent at a time on a monthly basis and to set up a Family Goal that we all will benefit from when we achieve it. We realize that it will take Courage to overcome our Fear of Saving, and Conviction to help overpower our Intimidation that we should spend now and pay later, and, it will require Right Actions that benefit our Children, and our Children’s Children’s Children to overpower the urge to become Complacent and fall back into old, bad habits. Therefore, we ask for the support of the Sentinels of Vigilance to help us fight the Beast of Debt and to aid us, as a family, to be Victorious in our goal to be Debt Free so we can be Masters not Slaves to Debt. T he Month of _______ In the Year of________________. Go To Yesterday's Story "The Pregnant Belly Of Olympic Vigilance"